The Vortex Boiler House is a Regular oil boiler which has been designed and manufactured by Grant to be placed in a garage or cellar. It is a condensing, floor standing boiler from an award-winning product range which includes a range of features and benefits. This boiler has an efficiency rating of 90.7% which means it is A rated. The output of 21kW makes it perfect for the smaller homes which do not have such a high demand for heating or hot water. 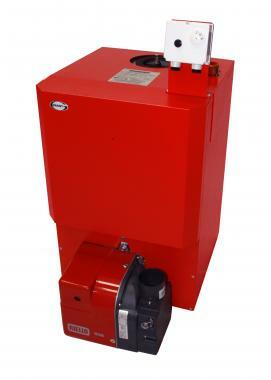 This boiler features a red powder coated steel casing, an unique Grant Vortex stainless steel heat exchanger and a Riello RDB burner with plug and socket connections. All off these features deliver a reliable unit you can be sure won’t let you down. This boiler’s compact design enables a simple and quick installation which can help to save you time and money on installation costs as well saving space in your home. This boiler is a Regular boiler so it needs to be installed as part of a heating system alongside a hot water storage cylinder, cold water storage tank and a feed and expansion tank. This means it is not really suitable for smaller homes where space is limited. This boiler is available in a range of outputs from 15kW to 70kW making the unit perfect for just about any home’s heating and hot water demands. This boiler also comes with 5 years warranty as standard to give you peace of mind.